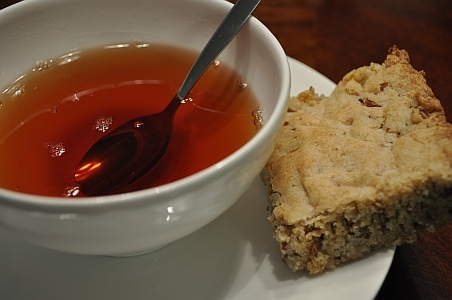 As winter begrudgingly gives way to spring, it’s the perfect time to sit down with a fresh cup of tea and this shortbread bar. Its been a rough couple of years in terms of the ongoing Great Recession, and it’s time to take a breath. Its been a tragic couple of weeks for the people of Japan and we mourn with you. Open your heart and wallet as you are able…making certain at the same time that you are not conned by checking here first. 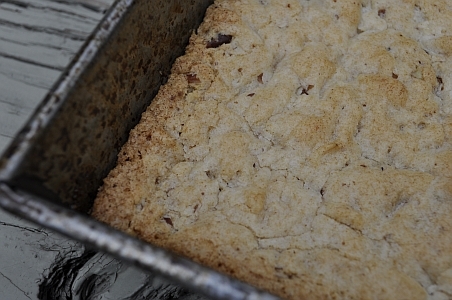 This cookie bar is tender, lightly sweet, and crumbly in the best possible way. I must also remind you of the very best way to cut bar cookies and brownies: use a plastic knife! (By plastic knife I mean the disposable kind that come with your to go order.) It gives clean, precise cuts without the old issues of clinging crumbs and ragged edges. To add even more interest to these bars you can consider additions such as toffee bits or mini chocolate chips or go the other direction and eliminate the nuts for a minimal effect. I am raising my teacup to you. May you find a bit of peace and rest in the midst of the busyness and stress of everyday living. May your spring come softly. Preheat oven to 350° F (176°C) or 325°F (162°C) for convection ovens. Lightly grease/spray an 8 inch (20 cm) square baking pan. Combine the flour, nuts, baking powder, and salt in a medium bowl. In another medium bowl cream the vegetable shortening with the sugar. Beat in the egg and the vanilla extract. Gradually add the dry ingredients and mix. Spread the dough evenly in the prepared baking pan with a rubber spatula. Bake for 20-25 minutes, or until a toothpick inserted in the center comes out clean. Cut into bars (using a plastic knife) and cool in the pan on a wire rack. Your gf shortbread bars look ooh so pretty & ooh so wonderful & lovely! Thank you Sophie! My computer went down and spent that last couple of days getting repaired. It felt so good to turn it on tonight and read your sweet compliment. I really enjoyed reading your blog post today and learning a little bit more about you!